Get noticed with out ergonomic and sleek Stylish Senator Centrix Printed Pens - perfect cutting edge ball point pen that features customisation on both the barrel, clip and colour choice. The screen printing offers a subtle yet bold appearance of your Company logo and branding - which is ideal to gain some retention and brand recognition for your advertising campaign. 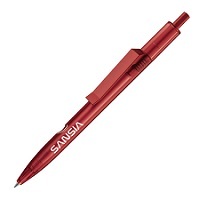 Designed in Germany, this ergonomically designed promotional ballpen offers that touch of panache and style that most ballpens just can't provide, and the price to performance ratio is fantastic, so if you're on a budget - our Stylish Senator Centrix Printed Pens are just the thing for you. For a FREE QUOTE, please fill in the form regarding our Stylish Senator Centrix Printed Pens and we'll be able to help you.